Louise Barteau described the impacts of the two commercial Fairhaven Wind turbines, illustrated by yellow dots on the map. The blue dot is the new elementary school located less than half a mile from the turbines. Pink dots represent the clusters of households from which complaints have been lodged. 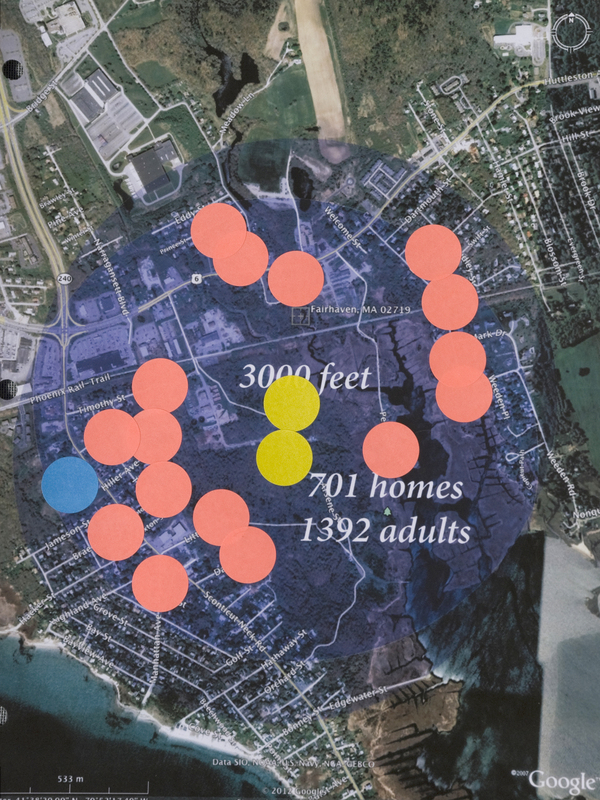 In Fairhaven there are 701 homes within 3000 feet of 2 1.5 mw Industrial Wind turbines. Since the turbines were turned on in May 2012, there have been over 450 citizen complaints from 59 households. After the first 100 complaints, the Fairhaven Board of Health asked for help from the MA DEP who performed sound testing to measure noise. I went out at night with the DEP while they performed the testing. The MA DEP has found the turbines to be louder than the allowed 10 decibels over ambient on four nights out of the nine nights that they tested over the period of a year. I became an advocate for the people in my town after I experienced pressure in my ears and head, dizziness, and nausea in May of 2012 in my art studio located 963 feet from one of the turbines. I was able to move out of my studio immediately, as my landlord let me out of the lease early. Since I moved away I have tried to become an advocate for my neighbors who cannot move away so easily. Louise describes her work to bring experiences of other residents to light and reports one family’s story in her full statement.